7 − four = Required Please enter the correct value. The Alibaba IPO date is still at least two weeks away, but Alibaba's Chairman and co-founder Jack Ma is already feeling the impact of the massive stock offering. According to Bloomberg's Billionaire Index, Ma's net worth has been calculated at $21.9 billion, making him China's wealthiest citizen – by a wide margin. The next closest person on the list is Baidu Inc.'s (Nasdaq: BIDU) founder Robin Li, who has a net worth of $16.6 billion. The founder of Tencent Holdings Ltd., Ma Huateng, is third on the list with a net worth of $16.4 billion. Jack Ma controls a 7.3% economic stake in Alibaba Group Holding Ltd. (NYSE: BABA), a Chinese e-commerce giant that was valued at $154 billion according to a Bloomberg survey of analysts in July. At that valuation, Ma's stake is valued at roughly $11.2 billion. "The wealth creation in China has been quite rapid, particularly among entrepreneurs such as Jack Ma that have created businesses that benefit from China's burgeoning middle class," Dalton Investments portfolio manager Tony Hsu told Bloomberg. 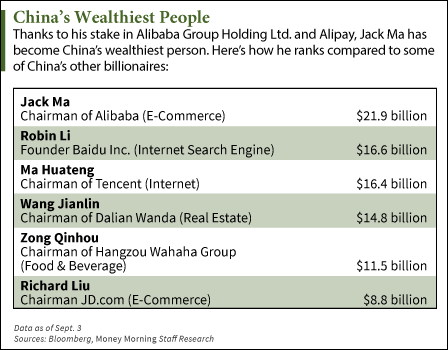 Ma currently has a $5.3 billion lead on China's second-wealthiest person, and following the Alibaba IPO, that gap should increase. The same survey that pegged Alibaba's valuation at $154 billion estimates the company will be worth up to $200 billion following the initial public offering. That would make Ma's stake worth roughly $14.6 billion. But it isn't just the stake in Alibaba that's created Ma's wealth – the billionaire also holds a 48.5% stake in Zhejiang Ant Small & Micro Financial, which is the parent company of Alipay. Alipay is a third-person payment service that processes online transactions for Alibaba similar to how PayPal handles eBay Inc.'s (Nasdaq: EBAY) transactions. Alipay handled 78% of Alibaba's gross merchandise volume in the quarter ending in March, and has been valued by Bloomberg at approximately $25 billion. Ma's $21.9 billion currently ranks him No. 35 on the global list of billionaires. But that's a list that the 49-year-old, Hangzhou native should climb quickly.